Beth Ann & Jessica's Helpful Savings: 6pm: Skater shoes up to 70% off! Want some rad skater shoes but don't want to pay the retail price? 6pm.com has tons of them up to 70% off right now! 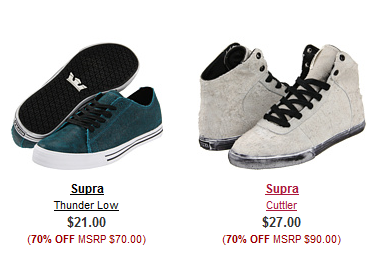 They've got brands like Supra, Emerica, DC, Gravis, Vans, Lakai and more! Get 7% cash back on your 6pm.com purchase when you go through the Shop at Home link below! Earn cash back on all your online purchases! Sign up now for a $5 credit too!